Farley’s style and visual language is distinctly his own. His humanoid figures have pinched eyes, simplified bodies and wiry limbs. Landscapes are lushly colored and unparticular of time and place. Interestingly enough, Farley finds inspiration in something as mundane as walking around a shopping mall. His ideas are sparked by various stimuli such as colors and designs. His creations are very distinct as they are often described to be whimsical and a little unnerving. His humor, Farley’s artworks are narrative-rich and are drawn from personal experience and dreams. 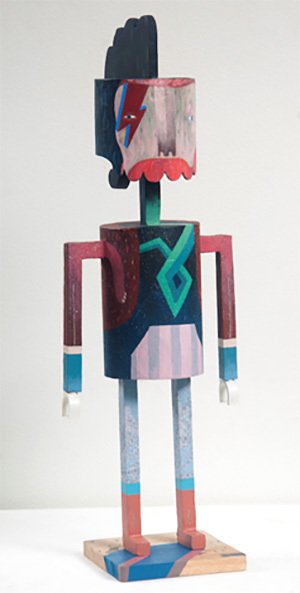 He uses large canvasses, mixed media sculptures and shaped painting sculptures hybrids as expression of the self. Baby Walk shows a child sitting atop a four legged high chair with a pacifier in his mouth and a baby rattle. This high chair, in particular, has four legs that are made for walking away from home which signifies the child’s development from infancy to adulthood. Without Permission depicts parent playing with a shape sorter toy. They are sitting on a loveseat, surrounded by stuffed animals and a strange one eyed creature. The shape sorter is the focal point of the piece, triggering nostalgic memories of playing with toys. Farley’s exhilarating experience as a young musician is seen on this painting. The world famous guitar trio romantic is seen performing aboard a boiling a one eyed kettle as it sails in twirling sea, interrupted by a colorful stalks that resemble a group of submarine periscope. Jarganauts harkens back to vintage tin robot toys that were once popular from the 50’s to the 70’s. The fifteen robots feature an electric mix of images, from lucky cats and multi-colored birds, to a sacred heart and David Bowie as Aladdin Sine. His Daydream pieces – a series of five shaped canvases combined with sculptural elements – showcase the breadth of Farley’s imagination. Despite having never ridden an amusement park ride, he mashed up old style rides with wind up musical boxes and sculptures to create the effect of a layered diorama. Welcome to the Playpen serves as a point of transition for the multiple identities Farley juggles. 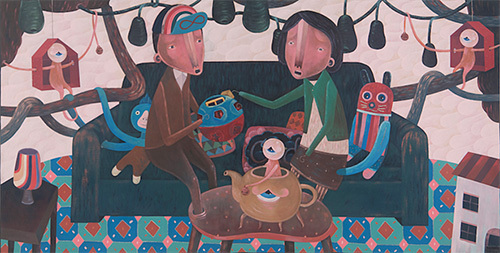 By combining the nostalgic with the current, imagined the real, and the thrilling energy of the new with a heady longing for the old, he invites viewers to see something of themselves in his whimsical creations. With his distinct visual language, he playfully explores the luminal space between seeing and believing, blurring the lines between fantasy and perception. By using objects such as baby toys, musical instruments, Darth Vader and teddy bears, he knocks on family doors to find realms of meaning, inviting everyone to come out and play. 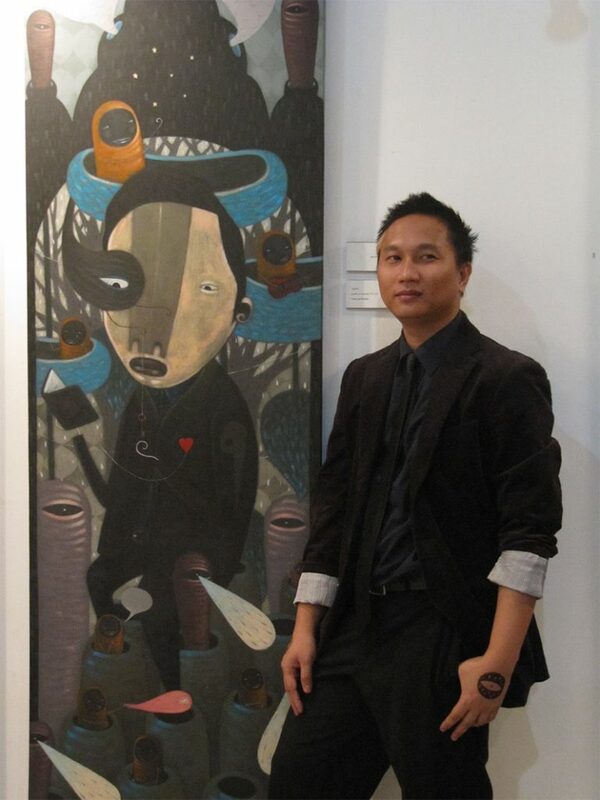 Farley Del Rosario is a young contemporary artist of the faux-naif genre. In 2009, he was recognized as one of Nokia’s 10 Most Exciting Young Artists. He has graced the Fookien Times publication. He also launched “Picasso” a community of aspiring artists in his city.